Not all posters featured in this weekly column are winners. Some will be oddities that are so peculiar and wrong-headed that they deserve notice purely for existing. Such is the case with today's kooky-crazy Polish theatrical one-sheet for Steven Spielberg's seminal 1977 science-fiction masterwork Close Encounters of the Third Kind. Designed by brilliant artist Andrzej Pagowski, this is a classic case of what happens when a painter is asked to depict imagery for a movie they have no frame of reference for. 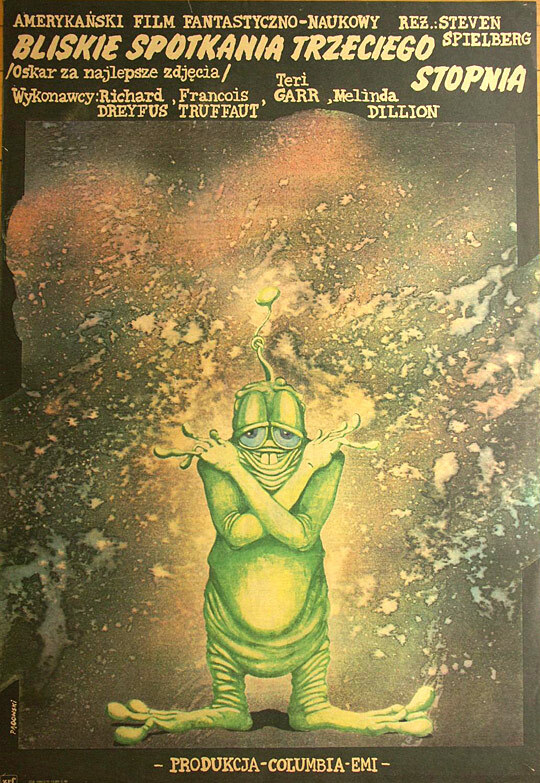 Todd Gresely, director of Monstrose, Houston's Retro Gallery - which ran an exhibit of Pagowski's work in 2007 - said of this bizarro piece that "The government probably said, 'we're getting a movie about aliens, make the poster.'" Thus, the artist conjured up this goofy, green Saturday morning cartoon character with a slightly stoned-looking grin and ran with it. While there's nothing inherently wrong with the artistry of the one-sheet, it is hilariously off-the-mark. The silly, droopy-lidded alien bears zero resemblance to the extraterrestrial visitors in Spielberg's opus (it's actually closer, physique-wise, to E.T. ), and the piece's tone lacks any of the mystery and awe promised by the standard North American poster. Polish audience members could easily be forgiven for thinking they were buying tickets to a children's movie. Oh, and Richard Dreyfuss' name is spelled incorrectly. Oops. That said, I dig the glowing, splattered background of stars and constellations, and the unrestrained weirdness of the design. While not remotely representative of the film, I'll be damned if it isn't still charming in a decidely off-beat way. This one-sheet is pure broad, goofy fun. It's just not Close Encounters. I would recommend, however, you take a closer look at Pagowski's diverse catalogue of work. There are some truly breathtaking gems to discover. Personally, I love the Wall Street, Patton and Rosemary's Baby one-sheets. Hopefully, I'll get around to featuring some more of this artist's striking efforts here in the future. Under the "Cool" category, of course.